Specifically designed for the original equipment manufacture (OEM), the XP02-115AC-Q DC motor speed drive provides high performance at a low cost. This drive is well suited for XL series drive candidates who do not need all of its features. The XP02-115AC-Q takes an AC line input, rectifies it and filters the output to create a DC bus that is chopped by pulse-width-modulation (PWM) circuitry to provide nearly pure DC power to the motor. The result is a form factor of 1.05 or less throughout the entire 80:1 speed range; compared to a 1.37 form factor from standard unfiltered SCR dirves. The near unity form factor results in smooth, quiet, cool and low maintenance motor operation. In addition, the low form factor allows drives to operate lower voltage motors without additional circuitry. The XP02-115AC-Q drive is versatile and can accept any AC voltage between 70 and 130VAC and contain a unipolar power supply, which enables the drive to accept DC (100-160VDC); unlike typical transformer-coupled drives. Depending on your application needs, this drive will provide speed control for motors ranging from 1/20 through 1 HP. Low cost: Designed for OEM applications. User adjustable calibration pots: IR compensation, max speed, current limit and acceleration/deceleration. Stopping modes:Decelerate to a stop (N.O.) or add dynamic braking switch and resistor. 22kHz switching frequency:A high switching frequency means a quiet motor! 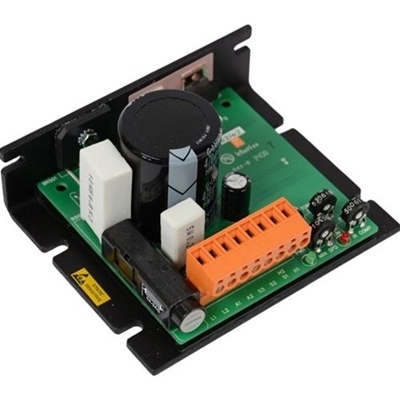 Accepts AC or DC input: Can accept 100-160VDC input or 70-130VAC. Options:''-Q'' option adds a cage-clamp type terminal block and on-board fusing.